The machining of the manganese liner plates is now finished and they are being checked for for the fit on to the horn blocks and horn guides. Machining of the brake hanger brackets has commenced. The various stay bars have been made for the footsteps. The injector support brackets, which are located behind the cab footsteps on the fireman's side, have also been made. The launch of the Wheel Appeal earlier this year has proved to be very successful, largely thanks to the appeal leaflet which was distributed in SVR News and also as a result of the feature article and full-page advertisement in Issue 401 of Steam Railway. At the time of writing, we are well on the way to having the necessary funding for the driving wheels to be cast, and Tony will shortly be seeking competitive quotes for this job. At the same time, we are conserving funds for the pattern-making, casting and machining of the cylinders (see December 2012 Updates), which should be completed by the end of this year/early next year. In order to prevent "leakage" of monies reserved for specific stages of the project, we have organised our funds into a series of ring-fenced accounts under the Trust's umbrella. This makes it easier for Chris to plan ahead and ensure that the necessary cash is always available when it is needed. This is one of the reasons why regular payments by standing order are so valuable: we can predict, with reasonable accuracy, approximately how much money will be in the kitty at any given time. Thank you so much to all of you who are contributing in this way (and, of course, in any other). "Wow, Grandad, that's a smart little engine!" "Certainly is, son, and I helped to build it!" 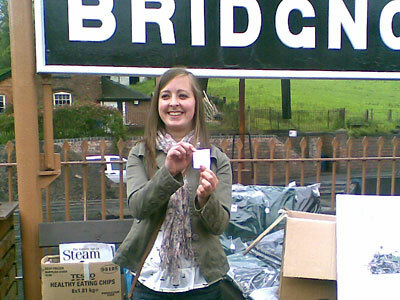 Victoria Andrews of Stourbridge draws the winning ticket for the 82045 SLT Raffle 2012 on Sunday 20th May. 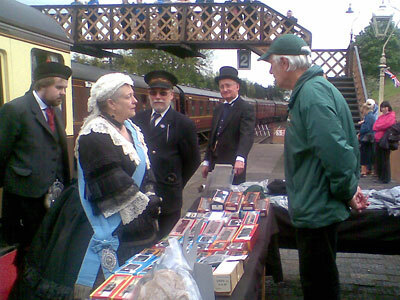 The lucky ticket holder wins a place on an Introductory Footplate Experience on the SVR. On the same day, and still on a theme of Victoria, the diminutive monarch addresses 6' 3" tall Tony: "We are most amused by your extraordinary head apparel, Mr Massau. From which part of our Empire does it hail, and can we have one?" Trust Members' Raffle winner Steve Harris of Prescot, Merseyside, poses in Chris's grease-top cap at Bridgnorth before his return footplate trip to Kidderminster on Thursday 10th May. 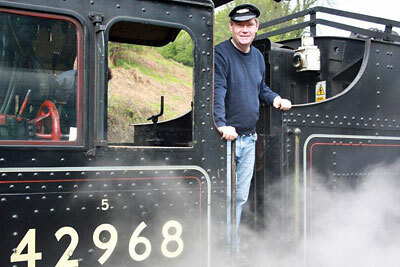 Steve fired 42968 for most of the outward trip, and showed great promise for training as a fireman.